Saab's all-new Sport Sedan, announced May 13, replaces the current range of three and five-door hatchbacks and is the first step in a carefully phased five year growth plan targeted at raising annual sales and production figures to over 200,000 units, virtually double current levels. In recent years, 'downsizing' has become an international consumer trend in automotive sales. In the premium sector, it has fuelled the sales of smaller, 'compact' cars at the expense of their larger counterparts. Over the last 10 years, for example, global sales of such smaller, 'D' segment premium cars have grown by almost 50 per cent, to 1.4 million units last year. In contrast, sales of larger, mid-size cars, such as the Saab 9-5, have remained largely static, declining marginally to 0.8 million units last year. Almost alone among the world's premium manufacturers, Saab has continued with its traditional, hatchback formula. However, the 9-3 premium segment is dominated by sales of sedans, which account for almost 60 per cent of the total, the remaining 40 per cent being wagons, convertibles and coupes. 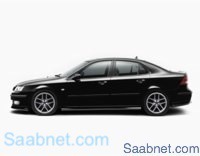 Now with a new 9-3 sedan model available, instead of a hatchback, Saab is positioned for the first time to compete on a like-for-like basis in this large and growing marketplace. Research also shows that if versatility is an important requirement, customers now prefer a wagon, or estate car, rather than a hatchback. Hence, the significance of the 9-3 Sports Sedan as the first, core product in the roll-out of a number of distinct variants. A sporty, 'fun-to-drive' focus is also an essential 'qualifier'. Customers in this segment are younger on average, aged 35 to 45 years old, and place a higher priority on a sporty, performance-orientated experience. In this respect, the positioning of the new sports sedan draws more strongly on Saab's tradition for fine chassis dynamics and turbo-inspired performance than in any previous model. Whilst the arrival of new 9-3 initiates the first phase of a product-led growth plan, Saab has already laid the foundations to deliver higher production volumes and quality levels: the completion of a massive SEK 4.5 billion plus investment in new facilities and machinery at its Trollhattan plant, 80 kilometres north of Gothenburg. Saab has, in effect, built the equivalent of a new factory. Production of the new 9-3 in July will see a 21,000 square meter extension to the Assembly Shop come on line. The biggest investment in this area for more than 40 years, it allows highly flexible working with the assembly of different models on the same line. Last year, a 12,500 square meter extension to the body shop was completed, again allowing different body parts for different models to be produced simultaneously. And a new, fifth press line has also been added to the Press Shop, as well as more efficient procedures giving a 30 per cent increase in productivity. Include the addition of an entirely new Paint Shop, among the most modern and cleanest in the world, and all the main production processes at Trollhattan have been enlarged and modernised. "We have the tools to do the job," says Saab Automobile's President and CEO, Peter Augustsson. "We have the products we need under development and we have the capacity we need to meet our goals, including the highest levels of quality assurance." "It is fair to say that Saab is raising its game. For the first time, we have what we need to consistently build our market share year on year." The investment in new products and production facilities is the largest in Saab's history and has been planned and resourced with the full co-operation of owners, General Motors. It is a clear statement of GM's commitment to the expansion of Saab as the leading European premium brand in its portfolio of auto manufacturers. "We have also done a great deal of work in identifying and clearly defining the key characteristics of the Saab brand," says Vice President-Sales and Marketing, Mikael Eliasson. "We have examined how we should best communicate the brand. Apart from more tightly focused marketing, that also means taking the Saab brand out to locations where our customers work, socialise and travel. For example, there are innovative 'shop windows' for Saab, such as brand centers at airports and railway stations, and new retail outlets at prestigious, metropolitan locations around the world. "This has all been a pre-requisite in the build up to the successful launch of our new 9-3 product."